As a general rule I don't eat desserts or candies that do not involve chocolate. I only have so many calories to spare and don't like wasting time on anything other than my first love. Candy corn, however, may be the exception to that rule. It's addictive and so small. What's another one . . . or two . . . or ten?! 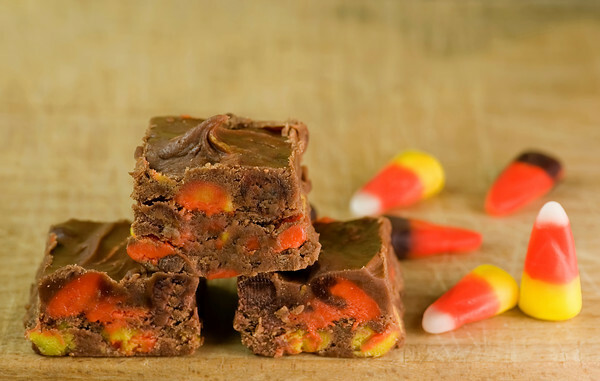 So imagine my pure delight at the thought of candy corn fudge. Little Miss Thang will be beside herself with excitement -- fudge is her 1st favorite treat and candy corn is also high on the list! Honestly, if I can get through the next few months and still fit into any of my jeans it will be a miracle of gigantic proportions. Either that or something else will take on gigantic proportions. 2. Remove from heat and stir in candy corn and chocolate chips, stirring until chocolate melts. Immediately transfer to foil-lined pan and smooth top until even. Chill until set, at least 2 hours. Cut into one inch squares. This is pure evil and the perfect Halloween treat! Click on through to Framed Cooks for a printable recipe!